Oceanfront condominium in the Windjammer complex. 3 bedrooms, 2.5 baths. Community street side pool and charcoal grills. 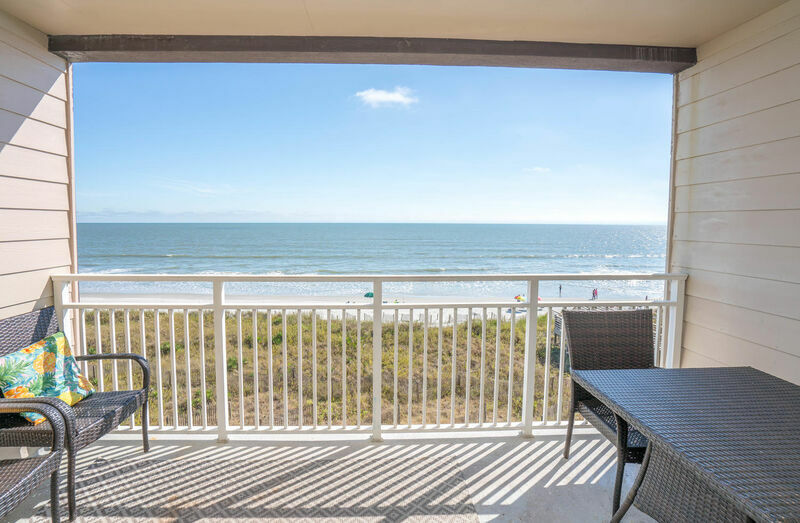 2 private ocean front balconies plus enclosed private back porch overlooking ICW. (games are no longer available) Building elevator. 4 flat screen TVs and Roku streaming stick. Wireless internet. Fully stocked kitchen with updated appliances and granite countertops. Jacuzzi tub in ocean front master bedroom/bath. Tiles floors throughout living area, kitchen, and bathrooms. 1 King, 2 doubles, 2 doubles. Sleeps 10. NOTE: Windjammer Condominiums does not allow guests to park the following on the premises: boats/trailers, RVs, golf carts, commercial vehicles, jet skis/trailers. We loved our first stay at Ocean Isle Beach!!!! The condo was so nice and clean and had everything we needed!!! We will be coming back again next year! !